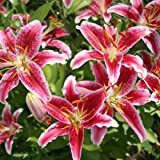 Stargazer lily growing herbaceous geophyte of the genus Lilium also known as Lilium Stargazer, Stargazer lily perennial deciduous used as ornamental fragrant plant, can grow in mediterranean, subtropical or temperate climate and growing in hardiness zone 3-10. Flower color can be: pink, red, purple, blue with white edge, the flowers are fragrant, flowers petal: clean, wavy, serrated edge, prominent edge, dots, stripe, more than one color, inner part color green, the flower in trumpet-shaped the stamens mostly yellow. 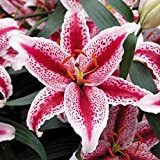 Stargazer Oriental Lily - 20 Bulbs Bargain Bag!! 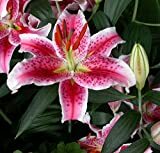 Trumpet-shaped flower with yellow stamens, flower color can be: pink, red, purple, blue most of the flowers have white edge petals, the flowers are fragrant, flowers petal: clean, wavy, serrated edge, prominent edge, dots, stripe, more than one color, inner part color green.